" A good ground is like a good strong cup of coffee first thing in the morning...what?" If you're interested, click the TV Icon below to visit our sister site and pick up a DVD. (... having trouble viewing this video? 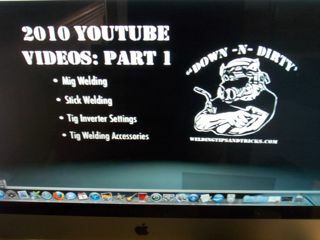 Click Here to view it at Welding-TV.com.) What the Hell is that thing on his finger? Ever have a hard time getting a good welding ground on parts that don't have a good place to put a traditional welding ground clamp? Braided copper wire could be the answer for your grounding problems. The kind that welding cable is made from. Every time I burn up an air cooled tig torch, or have a chance to get a few feet of welding cable, I strip the copper wire out of it and save it for helping me get a ground on odd shaped or big solid parts that wont accept a regular welding ground clamp. Just the other day, I was called to weld a solid stainless roller. The smallest diameter of the shaft was still too big to get a welding ground clamp and the shaft had a really smooth machined finish. Apparently it was from some type of food processing plant and that meant keeping it away from the carbon steel welding table so that it wont get rust on it later. Putting a stainless part on a carbon steel table to weld will contaminate the stainless with free iron particles make it rust later on. And not having a secure ground will make small arc spots that will rust. So the solution to all these issues was to just leave the part on the parts cart laying on a sheet of plastic...and then get the ground using braided copper wire wrapped around the shaft with the ground clamped on the copper wire. I have found this grounding trick to be especially helpful for mig welding too. Mig welding requires a good ground or else there will be sputtering and a erratic arc. A mig machine keeps feeding wire whether or not the ground is good... An inconsistent ground will drive you crazy when your mig welding. A poor ground connection can make you adjust the wire feed and voltage thinking the arc is unbalanced when the problem is just a bad welding ground. 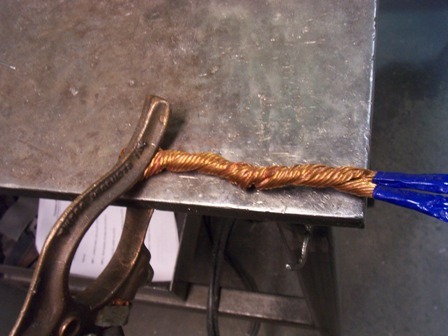 Quite a while back, I wrote about a tip for getting a better ground for mig welding using some braided copper wire twisted up like a big stick of licorice..
For round shafts or odd shaped parts, wrapping a piece of braided copper wire around the part works better than anything I have found. If you wrap it loosely , the braided copper cable will even let the part rotate without losing the ground even for a second. Lots of tiny contact points....that's the secret. You cant get that many contact points with a rigid jaw ground clamp. Lots of contact points is a good thing...that's why some of the newer Miller ground clamps have so many dimples on the jaws. But as good as the miller ground clamp is, it cant hold a candle to all the contact area you get using braided copper cable. Another situation where this tip comes into play is when you don't want to harm machined surfaces by laying them on a welding table. You can even wrap a few rounds of braided copper wire on threads without damaging them....if thats the only place you can attach a ground. And what about when you are welding stainless pipe or tubing and the ends are taped for a purge? where do you attach a ground clamp? 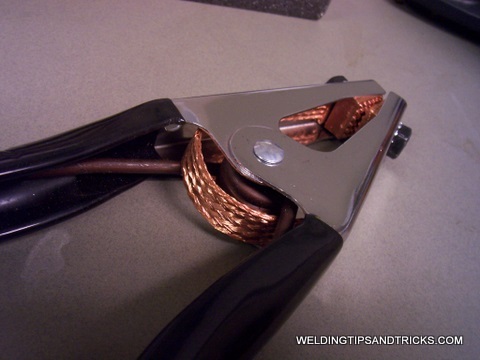 Braided copper cable lets you get a ground almost anywhere and is a good trick to have in your tool box. Another use for braided copper wire is for a heat sink on stainless tubing. If you strip the wire into smaller more flexible strands, it can provide enough contact to draw a lot of heat out of stainless tubing. Its got to be wrapped tight enough and secured with a hose clamp , tie wire, or something in order to be a good heat sink. But it can really help maintain that good straw and blue color everyone likes on stainless. more to come on this... its for another video and another day.